Experienced authors know that the most difficult part about writing a book is getting it published and marketing it. Sometimes authors will abandon the idea of self-promotion. Other authors allow an agent or publisher to market their book. 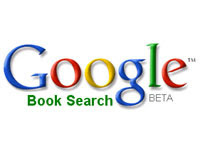 Many authors have no idea that Google Book Search is an option that is free and readily available to them. Ben Bunnell is the Manager of Library Partnerships for Google Book Search. In this role, he works with libraries in an operational capacity to get them started with the project to digitize books from their collections. Prior to this, Bunnell worked for two years at a venture capital firm as a business research librarian. He holds a Masters degree in library science and an MBA from the University of Michigan. What is Google Book Search? Google’s project to digitize all the books in the world. Google will allow these books to be indexed so that everyone can find them. How does Google Book Search work? How do you get the books into the index? Who is using Google Book Search and how are they using it? Can I download books – can I read the entire book? What are the technical challenges that you've encountered?